Scientific activity near deep sea vents may not be as harmful to some of their unique fauna as previously feared. Recently, researchers found lights used to illuminate the vents for study were blinding some Rimicaris exoculata shrimp. But new research shows that potential eye damage is not affecting shrimp numbers, and scientific expeditions pose no immediate conservation threat. The work is to be published in the UK's Marine Biological Association journal. 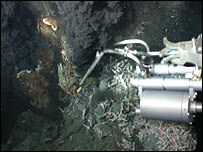 Hydrothermal vents are of great interest to researchers. These fissures in the ocean floor spew out plumes of fiercely hot, salty water which, despite the apparently inhospitable environment, play host to rich marine ecosystems. Some believe their mineral-rich make-up may give clues to how life started on Earth. But little light reaches these deep locations; to study them, deep-diving submersible research vehicles shine high-intensity floodlights, illuminating marine life normally used to living in near pitch-black. Research has shown R. exoculata, a 10cm (4in) long shrimp that feeds on bacteria living around the vents, is particularly sensitive to this. The light causes structural and potentially permanent changes to a light-sensing eye that is positioned on its back, effectively blinding it. 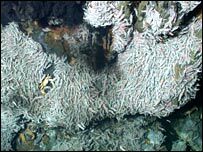 This has prompted some to call for more regulation of scientific activity around these deep sea vents. The conservation group WWF is seeking Marine Protected Area status for some hydrothermal vents, which would limit activity around them. To investigate the effects of bright lights on the vents' fauna, researchers from the University of Southampton, UK, and the Woods Hole Oceanographic Institution, US, investigated the Trans-Atlantic Geotraverse (TAG) hydrothermal vent which sits on the Mid-Atlantic Ridge. The researchers looked at shrimp population data taken in both 1994 and in 2004. The decade between had seen numerous expeditions from the scientific community and documentary makers. Dr Jon Copley, an oceanographer from the University of Southampton and an author of the paper, said: "If lighting was a problem to the shrimp, then we would expect to see a decline in their population, either in the area covered by the shrimp population or the actual population density of the shrimp." He said that damage to the shrimp's eye, which can sense the faint glow of the vents, could be adversely affecting their numbers. However, when the researchers looked at the R. exoculata data from 1994 and 2004, they found that the population had remained unchanged. Dr Copley said: "The idea that there is any imminent danger from current levels of scientific activity appears not to be the case." The researchers said they did not know why the shrimp was able to thrive without its light-sensing eye, but Dr Copley suggested that perhaps it was relying on other sensory organs. Dr Copley added: "These are absolutely unique ecosystems, and those involved in that work are the very last people on the planet who would want to do anything to damage them." Stephan Lutter, programme director of WWF North-East Atlantic Marine Ecoregion, said: "If the lights are still causing damage to the shrimps' eyes, even if it is not affecting their numbers, it is still important that this species is protected, whether by regulation in protected hydrothermal vent fields or through researchers' codes of conduct."